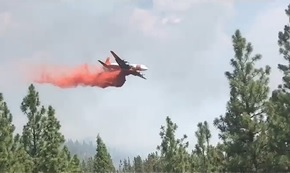 PRINEVILLE, OR -- Firefighters working the 27-acre Allen Creek Fire, 12 miles north of Prineville, report they achieved 100% containment, as of Tuesday morning. Two 20-person crews will continue mop-up activities throughout the day. Monday, they focused on hot spots and maintaining the perimeter; in some cases, they were able to work 100' into the fire line. With extreme temperatures expected this week, managers are now focusing efforts on making sure the fire does not rekindle or move outside current lines. The blaze was reported Sunday at about 11:30 a.m. and burned primarily grass and brush on steep and rocky terrain near Allen Creek Road, in northwest Crook County. The cause of the fire remains under investigation.